Mena Massoud stars as Aladdin, while Naomi Scott plays Jasmine, and Smith takes on the role of Genie. Smith debuted the official poster for the movie on Instagram a few weeks back, captioning it, "LEMME OUT!! Can't wait for y'all to see Me BLUE!" 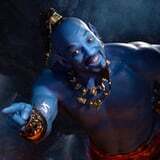 Get excited for the film with the trailer above, and catch Aladdin in theaters on May 24, 2019.